Don’t you hate it when you lose your notes on a recipe?! And such is the case for this little flavorful gem. I had slightly altered Ricki’s “Pepperoni” Beet recipe to make a side dish for dinner one night. But having lost my notes, I can only vaguely remember some of the alterations. Since I know her recipe is awesome as is, I will include it as she created it (with her permissions of course), only adapting it where I am positive. Recipe adapted from Diet, Dessert and Dogs. You will be amazed at how much the beets smell like pepperoni as you are preparing them! 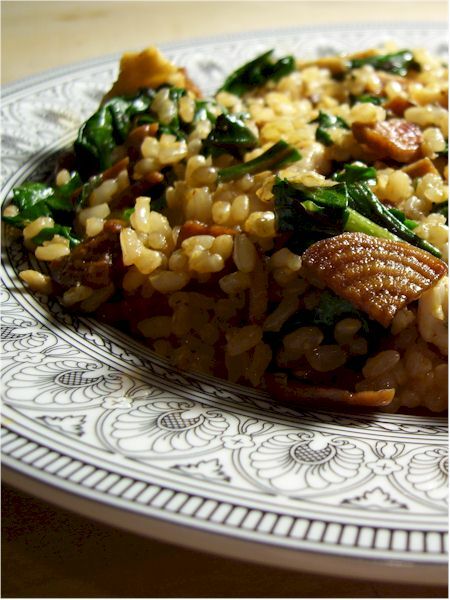 This recipe comes together quickly as you can cook the brown rice while the beets are in the oven and quickly saute the greens before they emerge. 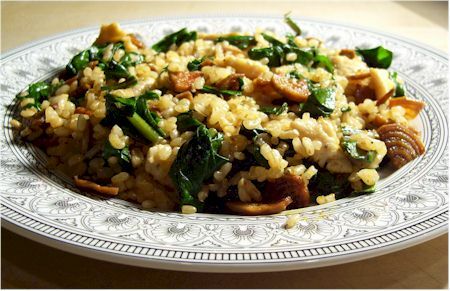 This recipe is Vegan, Vegetarian, Dairy-Free, Egg-Free, Nut-Free, Soy-Free, Low Sugar, and optionally Gluten-Free. Preheat your oven to 325ºF (170 C). In a small dish, combine the olive oil through the paprika. Place the beets in a 9 x 13-inch baking dish, pour the spice mixture over top and toss to evenly coat. Spread the beets out in the dish as best you can. While the beets are cooking, chop up the beet greens and saute them over medium-low heat in just a bit of olive oil until they are nice and wilted. When the beets are done, add the greens and brown rice to the beet dish and stir to combine. The flavorings and any leftover marinade from the beets should nicely disperse onto the rice too. 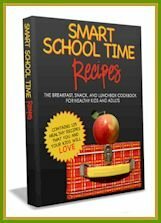 Blog Events: I am submitting this post to the Blogger Secret Ingredient Event (this week is beets!) and to Ricki’s new Sweet or Savory Kitchen Challenge – right back at you with this recipe Ricki! 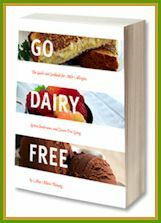 Giveaways: A copy of my book, Go Dairy Free: The Guide and Cookbook, is being given away at Nourishing Meals along with a great recipe from it! My New Website and Email Subscriptions!! Those beets look beautifully cooked! I can see the caramelization on them and I love it! That’s a great recipe idea! Thank you. I adore using beets with their greens. These were red beets? I’m surprised the rice didn’t turn red in the photo above. That looks wonderful, I bought some beets, but without their leaves at the weekend and I have lots of greens so I may make this. Alisa, this looks so yummy!! And I have beets (with their greens) in my fridge now… perhaps that will be dinner tomorrow night. Thanks for sharing! I was just thinking about her beet pepperoni today! I want to make it so badly! I am thinking for pizza night on Friday!!! Your eats look delicious…as always! Made this recipe tonight with some beets I got from a local community supported agriculture group I subscribe to. I normally do not like beets but found this recipe to be quite palatable. My husband loved it (beet lover) and my kids were disgusted. Overall a success for the adult population!